Two years ago I wrote about our Easter Donkeys. This year as Easter approaches, these sweet donkeys have even more meaning to me. I’ve reworked the original story a bit an added in some thoughts on how this symbol of grace, compassion, and kindness touches me today. Happy reading. Easter is one of our favorite times on the farm. The wildflowers are blooming, spring grasses are coming in, and all of the critters are feeling frisky. In addition, it’s a time to reflect on our faith and God’s grace. How do donkeys fit into that? We’ve had our donkeys for nearly seven years. The first year we had them, a friend said to us, “Oh how exciting, you have Jesus donkeys!” We were shocked and wondered what in the world were Jesus donkeys. A sweet donkey carried Jesus through town on Palm Sunday. The donkey was in awe of Jesus, most especially his kindness and compassion. One week later, that same little donkey was in the crowd as Jesus was crucified. He couldn’t believe the cruelty and torture that had befallen his new friend. The donkey was broken hearted. But he loved Jesus and to honor his friend he stayed until the end. As Jesus took his last breath, tears fell from the donkey’s eyes. The skies went dark, and the shadow of the cross fell across the donkey’s back. Forevermore the donkey would carry the cross as a symbol of his devotion to Jesus and as a message of God’s grace, compassion, and kindness. Sure enough, our sweet donkeys have a dark brown stripe that goes down their spines and a matching horizontal stripe across their shoulders, forming a beautiful cross. This cross reminds me of the crosses that we often wear as jewelry or on clothing as a symbol of our own faith. I’m also reminded that in this time of immense turmoil and side taking that God doesn’t choose sides. He loves us all. Sometimes we’ve used the cross to send a message. To shout our faith from the rooftops. As the animals so often do around the farm, they’ve given me a different perspective. The cross is truly a symbol of sacrifice, grace, and the ultimate compassion. Sweetie Pie shows off her Easter cross – a reminder of grace, compassion, and kindness. Now when I wear a cross, I wear it not as a message to all that I am a Christian, but as a personal reminder that I owe my fellow man compassion and kindness, for the ultimate grace was shown to me. As you celebrate this Easter and spring season, no matter your faith, we wish you comfort and peace. As you think about the symbols that are important to you, may you see them not just for the story that they tell to others, but also for what they say to you. This Easter Sunday on the farm, we’ll be spending a little extra time with our donkeys. Remembering why our faith is important to us, how grateful we are for the grace we’ve received, and most importantly focusing on the kindness we owe our fellow man. Life around the farm is pretty simple, and to be honest Cowboy and I just don’t watch the news much because it’s a whole lot of drama, and if you know one thing about Cowboy, it’s that drama is definitely not his thing. But lately some of the crazy talk is just a bit too hard to ignore. Frankly, I think it’s time we take a lesson from some of our animal friends. A couple of things to know about me and Cowboy. First, we are not political. We are the live and let let live sort. I’ve always liked the quote that your rights end where my nose begins, although a Google search to see who first said this leads to over a million results and a whole other debate. Secondly, we are Christians. That’s right, church-going, creationist-believing, gospel-music-listening Christians. (Okay, the gospel music thing is mostly me.) Do you think you have a picture of us in your heads? Have you labeled us yet? Let me throw you a curve ball. One of my very best friends is gay. Why does this matter? It’s something that has been on my heart a lot lately, and to be honest, as Christians, I think we can do better. For whatever reason, a fraction of Christians have decided that is okay to call out gay people, to condemn them, and now in Arizona refuse them service. Now I don’t want to get into a whole debate throwing Bible verses around about what is right and what is wrong, but there is one thing that as a Christian I undoubtedly know is right. Jesus called us to love one another, to love our neighbor as ourselves. As Cowboy recently said, “It’s our job as Christians to love and help people. We aren’t asked to be the judge or the jury. God will take care of that.” Have I mentioned that I just adore Cowboy? Enter my animal friends. You see, we’ve got all sorts of critters on the farm. And they are all a little different and they all have their quirks. But most importantly we love them all and they love us. We’ve got a dog who is a little too large (and yes it’s her thyroid). We’ve had a dog who was deaf and losing her eyesite. We’ve got horses who are deemed mutts by some, as they have no pedigree. We’ve got a donkey who still doesn’t trust us no matter how hard we try. We’ve got one horse who blows at everything, another who can’t leave anything alone, and another one that requires special food and minimal dust for her allergies. But they all work it out. They accept each other, despite their differences they enjoy their life at Wild Horse Valley. So why do you ask am I still in church? Because I know that those rules, that crazy environment was made up of mankind, and in general we humans have an amazing ability to screw things up. My faith, my belief is in Jesus and God. My focus is on being the best person I can be. That means loving my neighbor, and my dear sweet friend. He and his partner are welcome in our home anytime. Cowboy and I appreciate their friendship. There really is nothing to be scared of. My friend has never asked me or Cowboy to be gay, he’s never thought we were odd for not being gay, and we’ve never caught any cooties from him. The truth is, he’s been nothing but patient and kind as I’ve asked him lots of questions to try to help me understand things that he experiences. My friendship is the least I can offer in return. 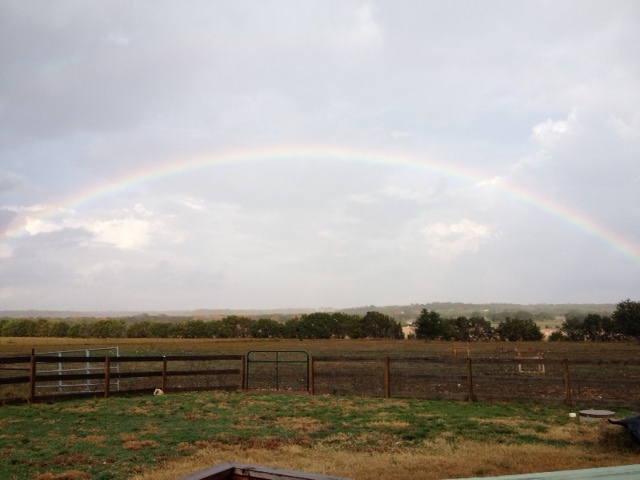 A glorious rainbow over the farm. A reminder of God’s love for us. Can’t we find it in our hearts to love others? So yes, I am a Christian. One of my best friends is gay. These two things really can co-exist. The rainbow is the symbol that God gave Noah that he would never again destroy the world by water. Let us not destroy the world with hate.